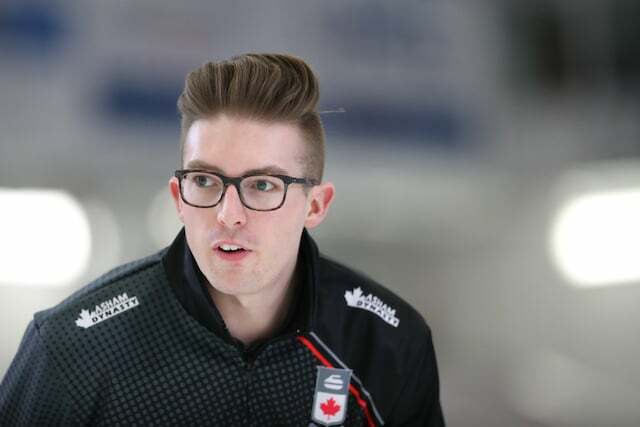 Welcome to Magical Question Fun Time, the Curling Canada feature in which comedian John Cullen sits down with your favourite curlers for interviews like you have never seen. 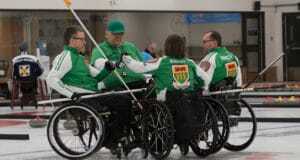 Each interview will feature eight questions: five standard questions for each curler, two questions specific to the featured curler, and one question provided by the previous curler interviewed. 1. Nicest shot you’ve ever been a part of? 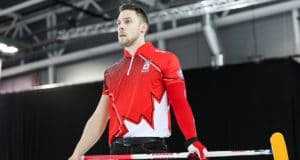 Matthew Hall: I think one of the nicest was the 2017 Junior provincial final in Ontario, the year I ended up losing the Canadian final to Tyler (Tardi, who he would later win the World Junior title with). We were playing Kieran Scott, and there was a cluster of rocks in the four-foot. It was one of those you spend so much time looking at all the angles, and after three minutes of staring at it, you still have no idea if it’ll even work. You just get in the hack and throw it as hard as you can. MH: [laughs] That’s true in some ways, but in other ways, it looked like a sure steal and it had been all singles all game, so that would’ve been a big momentum swing. I threw it, rocks sprayed everywhere, and when the dust settled, we got one. It was a big shot to lock that end down after it got away from us, and I think gave us the momentum to win the game. 2. If there was an action figure made of you, what non-curling accessory would it come with? MH: I think it would come with a chess board, or a chess piece. I’m a big chess guy. It’s something I do in my off-time and I really got into it this year with all the off-time I had. JC: Yeah, I guess you moved to B.C. to curl, basically. So you just played chess all day? MH: Not all day, but just when I needed to feel smarter. [laughs] It keeps my mind sharp, and it’s something that I enjoy studying and learning how to get better. This was definitely the year where I started to actually get into the strategies of it and stuff, and not just take the game as it comes. JC: Are you playing live, or online? MH: Tyler and I would play each other a bit when we were on the road, but for the most part I just played online with random people. It’s an easy way to feel good and smart when you’re by yourself. 3. If you were forced to rob a bank, which two curlers—you can’t choose more than one teammate—would you choose to be on your squad, and what role would you play? MH: I would first go with an old teammate of mine, Curtis Easter. He’s a big, jacked guy who works out all the time, and he would be the one carrying all the bags of money to the van. Maybe apply some force if we need it. And then I would go with Sterling Middleton as my getaway driver, for sure. JC: You sounded very confident in that answer. Is Sterling a wild driver? JC: [laughs] The only issue is he would probably have to wear a hat to obscure his face and hide that big hair, he may not go for it. MH: You’re right, actually. He may not go for it. We’ll see if we can convince him, but when it comes to his hair, that’s tough. [laughs] And to answer the last part, I’ll take care of all the planning. Hopefully I can just sit back and watch the guys do it. MH: That’s a tough one, because I might need that job when I go back to Ontario. [laughs] Honestly, it has nothing to do with the boss or anything. 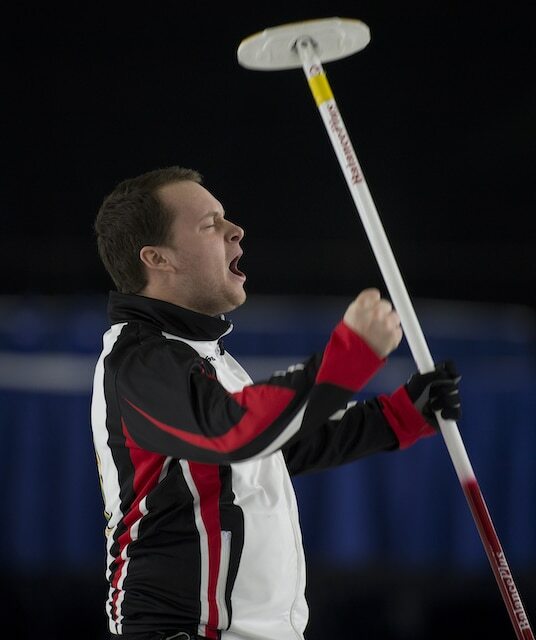 He’s a great guy and a friend from curling. He actually got me the job in the first place. But I worked in the summers for a steel fabrication factory, and I’ll just be the first one to say that manual labour is not my forte. MH: I had to ask my parents for this one, but I think I have a good one. So I guess when I was a kid, I thought that every movie was a documentary. [laughs] Any live-action movie, I just assumed everything in it was real, and true. I guess it all started because I saw Willy Wonka and the Chocolate Factory, and then just assumed the factory was real. I would bug my parents all the time to take me to see Willy Wonka and visit the factory, and it didn’t matter how many times they explained, I would insist. JC: And when did this end? 6. Alright, now we move on to the Matthew Hall-specific questions and for this first one, you probably can figure out my source. But I’ve heard that you walked around talking a lot about how you dominated Tyler Tardi in Mixed Doubles, but that isn’t actually true. And you lost to him in the Next-Gen final. So I’m giving you a chance. What’s the story? MH: Okay, well first of all, it was completely true. I have a better record against Tyler than he does against me. 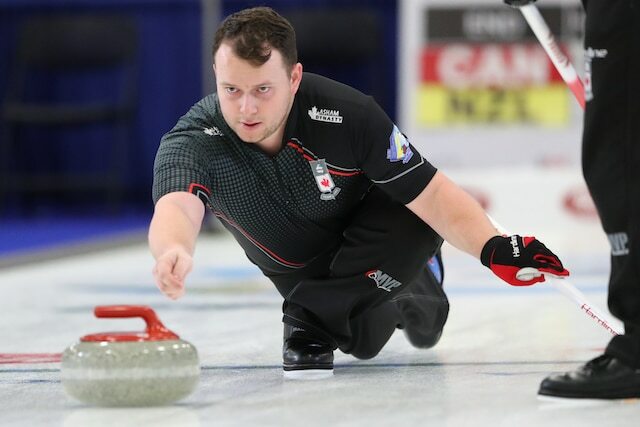 Throughout the season, him and his girlfriend (Dezeray Hawes, who, along with Tyler, will be playing at the 2019 Canadian Mixed Doubles Championships) would practice occasionally, and I’d practice with them. We’d always finish off with some mixed doubles. Or even if it was just me and Tyler against each other playing mixed doubles rules and throwing all 5 stones. I absolutely had the better record all season. But, they definitely had the last laugh in Estevan. I can’t deny that. JC: I mean, I believe you. It just must’ve been hard to lose to Tyler when it mattered. MH: It’s always tough to lose to your teammates, I mean, you wanna stick it to them, don’t you? But they’re a great team and they’ve played together for a long time, so you know it’s always gonna be tough when you play them. We gave it our all, and came up short. But Tyler and I always joke about it, it’s not the hardest thing in the world to lose to them by any means. It’s light-hearted. 7. I also heard that when you watched the Canadian final back after you played in it, you learned some things about yourself. That happens sometimes when you play on TV. What did you learn? JC: [laughs] What was so bad about it? Like you said, you won. JC: [laughs] The broom is just a guideline, my friend. 8. The last question comes in from my past guest and your World Juniors teammate, Selena Sturmay. She asks how you got the nickname Hot Dog and who gave it to you? MH: The nickname came from Molly Greenwood, who curls in Ontario. We’ve been good friends for a long time, since we were young, and I guess we were 14 or 15 and it came from me overreacting a bit. I wear my heart on my sleeve when I’m playing, to put it nicely. So I guess she said that I was “hot dogging” it out there, and started calling me “Hot Dog”, and it kinda stuck. The running joke is that Molly made the name, but Curtis Easter was the one who made it popular. JC: I mean, it could be worse. Thanks for joining me Matt, and do you have a question for my next guest, who will be Rachel Brown of Team Canada? MH: Ooh, yes! I’d like to know where she learned her dance moves from. She and Dana Ferguson are always dancing out there, and it’s clear she’s got a lot she could teach me, since I’m horrible at dancing. JC: Perfect! Thanks Matt, and best of luck with your move back to Ontario! 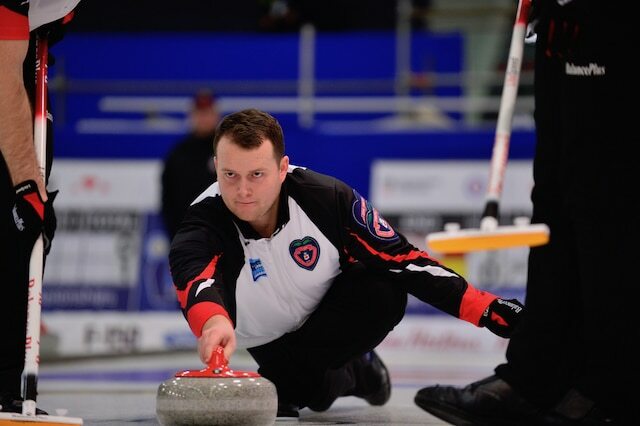 As always, you can follow John on Twitter @cullenthecurler and his curling interview podcast, Stone + Straw, at @stonestrawpod.